This article is for people who want to understand why investing is such an important factor in building wealth. For a comprehensive article on how to start investing in the stock market, read the article from my WTF series: How the F do I start Investing? 1) Why should I invest? Investors create the most wealth in this world. Not entrepreneurs, not inventors, not celebrities. The richest 1%, the Forbes 100, has more investors than from any other category. For the sake of simplicity, when I discuss “investing”, I will primarily be referencing investing in the stock market. However, investing can be applicable to commodities (like gold), stocks, bonds, equity in businesses, startups, projects, cryptocurrency, and real estate. Also, investing is generally long-term (years), while trading is short-term. Saving money is the first step to investing. Saving money is an incredibly important step, and should not be overlooked. However, if you save up a lot of money but don’t take advantage of investing, then you’ve taken out a lot of potential of wealth accumulation. If you don’t invest, then every time you look at your piggy bank, it will always be exactly how much money you saved. $100, no matter how many years you wait, will still just be $100. When you invest, that $100 can become much much more if you let it accumulate wealth. That’s the difference between saving vs. investing. Now, the piggy bank is real. Most of us save money either with a commercial bank or as cash. If you aren’t already, then you should be saving money. (The recommended saving amount is at least 10% of your income, 15-20% is ideal). However, not many of us actually invest our saved money. When we invest, we basically are investing into a piggy bank fairy who will add even more money to our account. Okay, so now that you hopefully understand that investing = accumulating wealth by using money to create more money over time and taking advantage of compound interest, let’s use some real-life examples with real numbers! Exciting. Scenario 1: One person who saves $100 per month and puts it into his bank account, or holds it as cash. This money is readily available for him to use, but really, he doesn’t touch this money because he is saving it for his future. Scenario 2: This person also decides to save $100 per month, but instead of putting that money into his bank account or holding it simply as cash, he puts that money into his investment portfolio and invests it into the stock market. The stock market has an annual average return of 8-9% (not adjusted for inflation) over the long term. 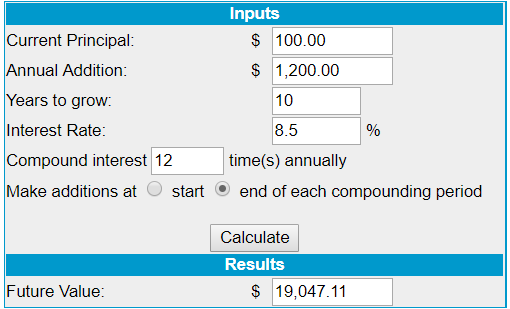 So, I don’t know about you, but I’d rather have $19,000 than $12,000 in 10 years. The key here is that scenario 2’s growth is exponential, while scenario 1 is simply linear. But let’s amp it up a bit on how much money you save. Let’s assume you are 25, have a relatively stable job after university, and managed to obtain a 60K salary per year. Now, general personal finance consensus says you should save and invest at least 10%, but ideally between 15-20% of your income. So let’s say modestly, you managed to invest 10% a year, ($6000 a year or $500 per month). If you manage to do this until retirement, which will probably be around 70 now because everyone is living longer, that means you have ~45 years to grow your investment portfolio. Let’s look at what happens to your wealth accumulation now. Yes. You will retire a multi-millionaire ($3,000,000+) if you just manage to save 10% of what you earn every month. 10%!!! That’s not very much at all, especially when you should be saving 15-20%! Compare that to just “saving” your money and stuffing bills under your bed sheets, you’d just have $270,000 by saving $500/month. Okay, I showed you 2 great examples of how over-time the growth of your investments will be. But, that is always over the long-term. Here is a graph of the REAL stock market returns (of the S&P 500). Notice how timing is everything. Some years, your investments might drop a lot! Obviously, we don’t want such bad timing. That’s okay though because we aren’t trying to be traders, we want to be long-term investors! Over the long-term, it will always trend upwards. Even the financial crisis of 2008, at the very low, recovered in just around ~4 years. So don’t panic in these scenarios. Investing for your future means, well, you actually have to wait till the future. 2) I am convinced. Where do I start? Great! I am excited for you. If you are ready to begin investing but don’t know how, you can start here: How the F do I start Investing?